Microsoft Lumia 535 comes with a 5MP auto-focus camera, coupled with an LED flash though it lacks a dedicated camera key. Microsoft has created a proprietary app for all Lumia smartphones called Lumia Camera. The Lumia camera interface is very familiar - it offers white balance, focus, ISO, shutter speed up to 1s and exposure settings. You can choose between 5MP 4:3 mode and 3.7MP 16:9 samples, there are no other resolution options. Additionally, you can get more camera functionality via Lenses. Our Lumia 535 came only with Lumia Cinemagraph (animated photos), but you can download more. The 5MP images taken with the Lumia 535 turned out quite good, with reasonable amount of resolved detail. Contrast is good as is the color rendering, although sometimes the white balance is off. Noise is kept well under control and we are happy with the overall processing. Finally, here is a 5MP shot snapped with the front-facing camera. The 5MP sharpshooters are getting very rare these days, but the few we get to review are getting better and better. The Lumia 535 does OK on all three charts, resolving a good level of detail, with very little noise and with accurate colors. Notice the yellowish spot on the ISO chart. Microsoft Lumia 535 camcorder is capable of WVGA@30 fps video recording. The videos are stored in MP4 containers and the bitrate runs at about 3 Mbps. 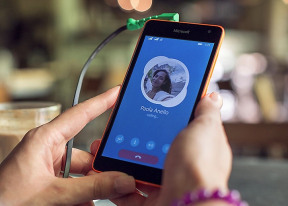 Lumia 535 captures the videos with mono sound at 160 Kbps and 48 kHz sampling rate. The camcorder interface is pretty much the same as the still camera. It offers only white balance and manual focus settings. You can also choose between WVGA and VGA recording. The Lumia 535 also allows you to choose the audio bass filter (off, 100 Hz or 200 Hz). Opting for 200 Hz (Strong) will capture much better sound when shooting at loud venues such as concerts or clubs. The resolved detail in the videos isn't as good as in the still images, but the colors and the contrast remain very good. Here is a 30s sample we've uploaded on YouTube. Also here is an untouched 480p@30fps video for you to download.